With UWP apps elements respond to the size and DPI of the screen. It doesn't matter if it's running on a big screen TV or a mobile the layout and scale will adjust to suit. With UWP you're not limited to just a keyboard and mouse, multiple types of input such as touch, pen, and Xbox One controllers can all be used. We have developed our store application to only be ran on windows 10 Desktop for the moment. Following the top link on the right will take you to our application on the Microsoft Store. 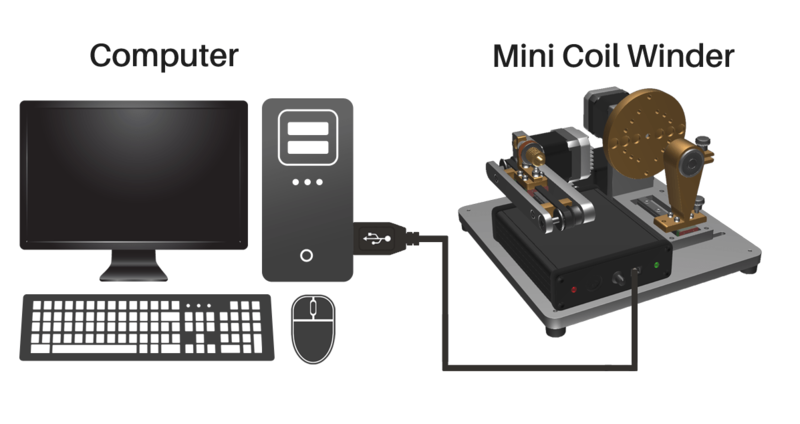 To connect to your Coil Winder simply connect via USB, see the infographic to right. Once all setup you can refer to the online software manual by clicking the link on the right. We have a seperate application for running on other devices such as the raspberry pi running windows 10 IOT. Clicking the link provided will allow you to download the image that can be deployed to the Raspberry pi. 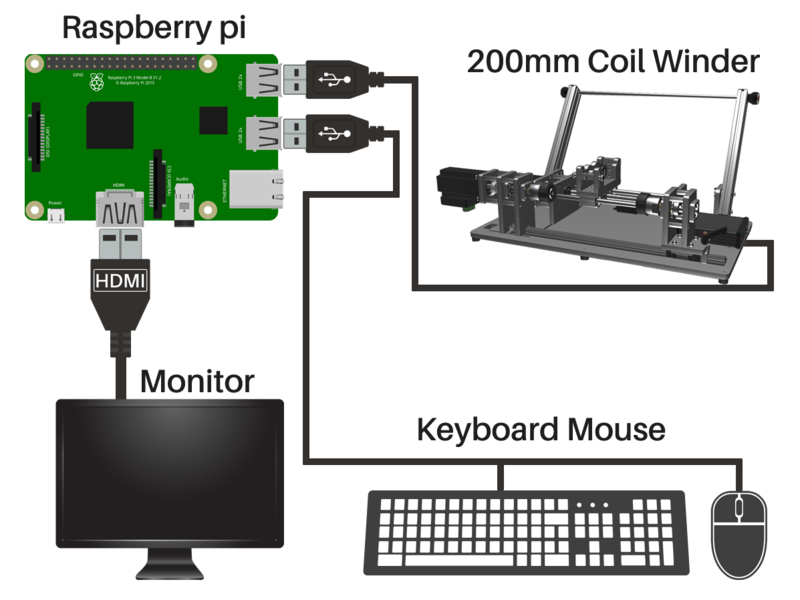 To the right is an infographic of the Raspberry pi setup with one of our Coil Winders. The software requires user input so a mouse and keyboard is required though a touch screen device can be a substitute for keyboard, mouse and monitor. Our software is currently under development as a BETA version so bugs are to be expected. Automated Winding - Set your parameters for creating a coil and let the machine do the rest. Bobbin Winding - For winding basic coils. Pickup Winding - More suited to winding guitar pickups. Mixed TPL Winding - for scatter winding (Mixes several different winding patterns with different parameters into one routine). Settings - Modify your settings to suit the machine - also enables the use of our Emergency stop kit. Import Tools - To import a backup file of all your coils from previous software. For full documentation on these features refer to our online manual. Scripting Engine - Create incremental scripts that control the machine down to degree movements. Absolute Scripting - Create and load CSV files with absolute positions to buffer loads of small commands. This removes any small delays that can be caused by the USB communications latency. LVDT Calculator - Generates LVDT Coils from user parameters. Manual Winding - For semi-automatic winding of guitar pickups. Key Mapping - Map controls such as "start", "stop" etc.. to key bindings.